New York may have the market cornered on pizza, bagels, and black & white cookies... but fried chicken? 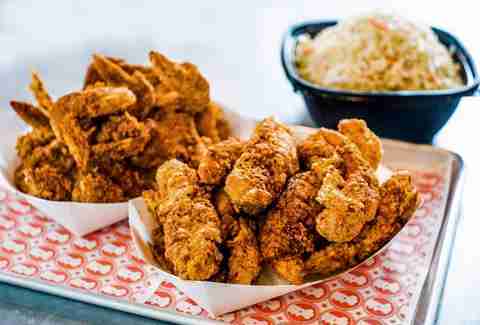 Sure, we may not be in the South, but that hasn’t stopped this city from making a name for itself in the fried-chicken scene. 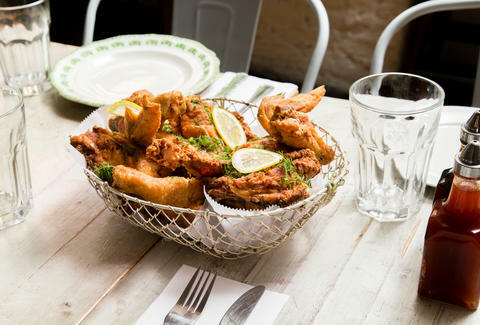 From casual, over-the-counter joints serving a mean chicken & waffles, to sit-down restaurants doling out Korean-inspired wings, the fried-fowl craze, which first took off in the city back in 2009 at places like Momofuku Noodle Bar and Locanda Verde, is still going strong. 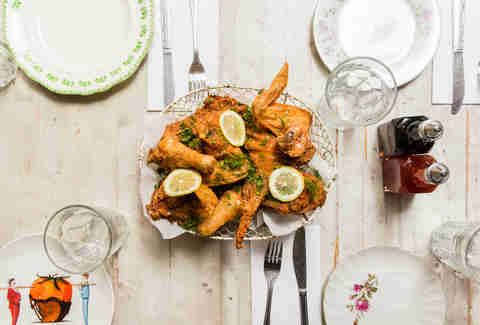 And with continued openings of old-school-style Southern joints and more inventive modern spots in recent years, there’s arguably never been a better time to enjoy fried bird in New York -- particularly at these 14 places. North Carolina-born chef Charles Gabriel got his start over two decades ago, peddling some serious comfort food from a truck. 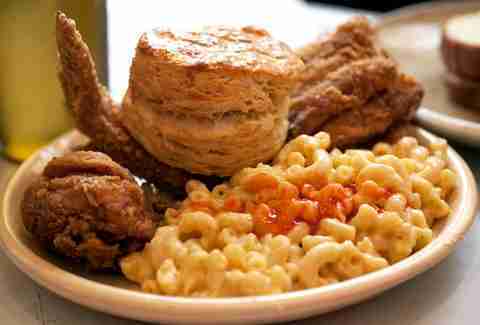 Today, he makes Southern soul food magic from his Harlem hole-in-the-wall. Using an old-fashioned frying technique in a cast-iron skillet, Gabriel coats the meat in a peppery dry rub, softens it in an egg wash, and dredges it in flour. What that means for you: greaseless-on-the-outside, juicy-on-the-inside birds that are bursting with flavor (it’s seasoned three times, BTW). It’s so tasty that you’re probably going to want to go with the all-you-can-eat dinner (which is just $13.99!). Collard greens, okra, and black-eyed peas are there to assist, should you need a healthy boost. Outfitted with blackboards and wood paneling, this charming Williamsburg spot doles out delicious Southern eats like smoked paprika-laced shrimp & grits, and crawfish hush puppies with jalapeño jam. 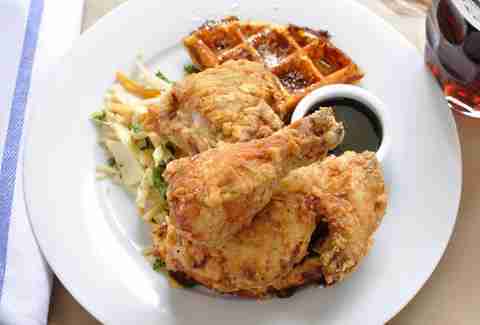 But the real headlining act is the sweet & savory chicken & waffles. Made in sweet-tea brine, dipped in buttermilk, and dredged in a spice blend, the whole impressively crispy shebang sits on a bed of flavored waffles (bacon-cheddar, rosemary-mushroom, walnut-parmesan). A bite of the Nashville-style hot fried chicken from this Bed-Stuy restaurant is almost as good as taking a road trip down to Tennessee. Seasoned twice with a killer combo of cayenne and ghost chili peppers -- the hottest in the world -- the crunchy, flavor-packed specialty is so good it will, quite literally, make you bawl. We suggest pairing it with a side of sweet corn on the cob or mild mashed potatoes, which will have your back when things get heated. Since opening inside a beer closet in 2006, Pies 'n' Thighs has relocated and expanded into two neighborhoods. No matter the scenery, the irresistible fried fowl -- which comes in the form of a bucket, box, sandwich, or chicken & waffles -- has remained top-notch. Opt for the free-range fried chicken box, which comes with three-pieces of crispy, juicy chicken, a buttermilk biscuit, and your choice of a side (burnt end baked beans, cheese grits, and smoked pork collards). Sure, good ol' Southern fried chicken will always hold a special spot in your heart. But if you want to see other birds from time to time, there’s plenty of exploring to do as well. Expand your taste buds (and inevitably, your waistline) with the deep-fried chicken at this East Village Thai spot. Marinated in garlic, white pepper, coriander root, lemongrass, and red curry paste before hitting the fryer, Somtum Der’s fried chicken offers a nice kick that you won’t get elsewhere. If you want to take things from lukewarm to hot, dunk the chicken in a special dressing made up of chili powder, fish sauce, tamarind sauce, and palm sugar. At first glance, this Clinton Hill spot looks like your average deli… and it would be, if not for its glass case of heavenly fried chicken. Sold by the piece, its thighs, drumsticks, and breasts are everything you could want -- salty, crunchy, and most importantly, cheap. Once you’ve crunched through the crispy cocoon (fried to the perfect bronze shade), you’ll find nothing but sweet, tender meat on the inside. Just $1.50 a pop ensures you’ll be back at Yafa’s for lunch, dinner, a late-night snack -- and let’s be honest, probably breakfast the next morning, too. Husband-and-wife team Rob Newton and Kerry Diamond pull out all the stops at their Southern-fried Gowanus restaurant. Drawing from the Arkansas family recipe of Mr. Newton, the chicken is soaked in salty brine and doused in buttermilk before it hits the fryer. The result: a divinely golden-brown bird that comes in several disguises. (Get it on a stick, straight-up in a bucket, by the piece, on a potato roll, or mixed in a collard green salad). With sides like tater tots and pimento cheese, braised collards with country ham, and mac & cheese, Wilma Jean won't do you wrong. This Harlem soul-food staple has been drawing in folks for its mouthwatering fried chicken since 1962, so there’s really no reason why you haven’t checked it off your bucket list yet. 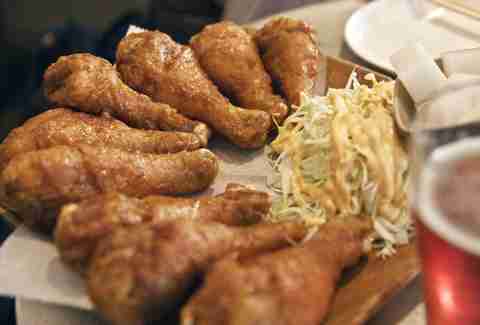 Sinking your teeth into the crispy, tender light or dark meat is a truly religious experience. Coat it in hot sauce or devour it bare. It’s so good, in fact, that the restaurant’s late owner, Sylvia Woods, was even dubbed the "Queen of Soul Food." 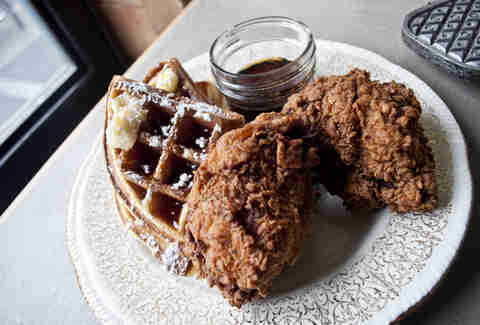 You can’t discuss fried chicken in the city without acknowledging this Alphabet City eatery. Here, the free-range chicken is brined overnight in sweet tea (hence the hint of sugar), then popped into a pressure cooker. Order the boneless chicken sandwich or bone-in fried chicken supper, which comes with a flaky hot biscuit and side salad. Chef/owner Keedick Coulter uses only humanely raised animals and local, sustainable produce -- so somehow you feel better after stuffing your face with pounds of meat (and an out-of-this-world pecan pie bread pudding). The menu at this Bronx soul-food joint is packed with hearty classics like beef short ribs, fried whiting sandwiches, and BBQ chicken, which are all perfectly tasty, but the buttermilk fried chicken is worth the trek alone. Arriving at the table dressed in nothing but a layer of grease, Paula’s fried bird is as no-frills as it gets -- and pairs perfectly with sides like candied yams, cornbread, rice & beans, or collard greens (it comes with your choice of two). End things on a sweet note with banana pudding or pecan pie. No, it’s not a superficial nickname used to describe a girl you once met at a bar -- it’s an East Village gastropub dispatching some of the most mercifully delicious fried chicken in the city. New Orleans-born chef Meg Grace dunks the bird, after several hours of brining, into buttermilk before rubbing it in a house mixture and frying it until it’s crunchy. Juxtaposed with the crispy, well-seasoned (and greaseless!) exterior, the meat inside is as gentle as a John Legend tune. Top off the hearty affair with amazing sides like kung pao escarole and chickpea-kale fries. 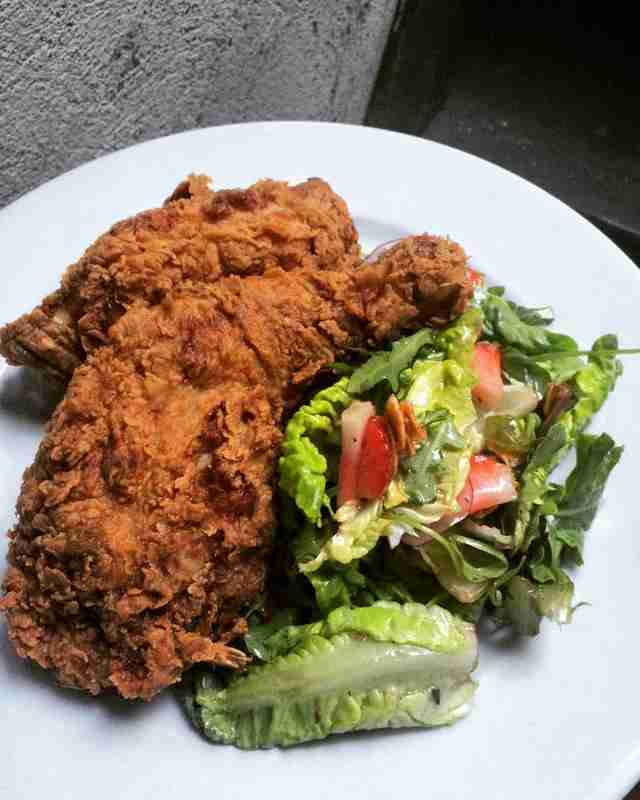 At this Carroll Gardens restaurant, fried chicken rules all. Fried not once, but twice, after spending all night in a buttermilk batter, the tantalizing, crisp-skinned bird is plated atop a cheesy cheddar waffle with savoy cabbage slaw and a balsamic maple syrup concoction. Sides like the buttermilk-whipped potatoes and cauliflower gratin round things out nicely, and the homey atmosphere (the communal table is fashioned from ceiling beams from an old Red Hook warehouse) seals the deal. The guy behind this late-night, hipster-packed restaurant/dive bar is the same (Stephen Tanner) churning out soul food gold at Pies 'n' Thighs. 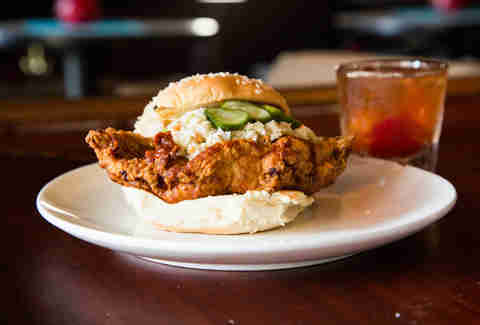 Much like his other Brooklyn/LES space, the fried chicken here just melts in your mouth. 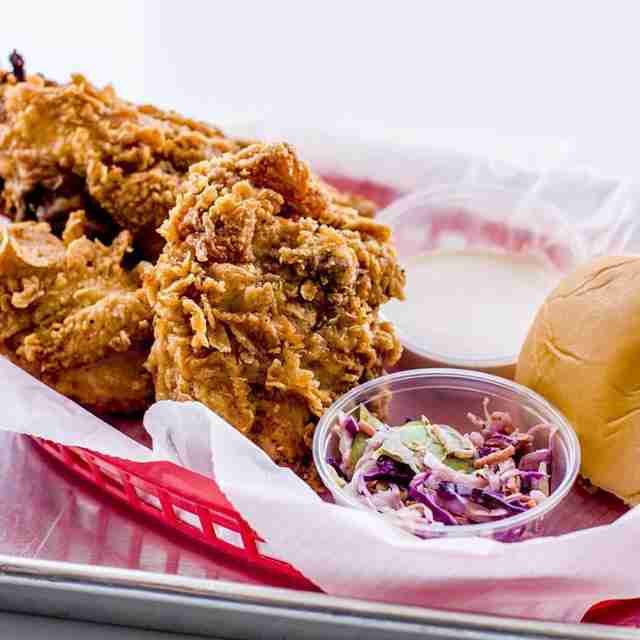 Order the fried chicken plate, which arrives with three sizable, peppery thighs that crunch with each bite, alongside biscuits and hot sauce and honey butter for dipping. Cocktails like the namesake Commodore (a piña colada with amaretto) are sure to get a good buzz going. But whether you're sober or not, the fried fowl never disappoints. Combining Champagne and fried chicken, this Lower East Side hangout has everything you could want from a Southern-style joint, and more. Chase a glass of bubbly with dishes like the Splitty-Split, a half-chicken that’s cooked and served in a skillet, or Winner Winner Chicken Dinner, a whole bird which comes with the works -- three sides, jalapeño cornbread, a buttermilk biscuit, and more. Head to the backyard to house it all down under twinkling strings of light. Trust us when we say this New Orleans-inspired restaurant is worth the trek to Astoria. Taking the fried chicken game to the next level, the geniuses here whip up bird in five different flavors: cinnamon sugar, chili honey, cherry pepper, spicy, and classic. Choose between white or dark meat, and one side (deep-fried popcorn okra, sweet potato fries, or sautéed collard greens with bacon, to name a few). If that’s not enough Southern hospitality for you, the cheerful ambiance -- with its quilted patchwork pillows and exposed brick walls -- should do the trick. This Midtown East (and Midtown West, and Astoria, and FiDi, and Bayside!) restaurant -- whose name literally translates to “my hometown” -- puts up stiff competition against its K-Town counterparts. And that’s all thanks to its addictive Korean fried-to-order wings, which come covered in a choice of spicy or sweet soy garlic sauce. For indecisive types, going halfsies is also an option. Harlem isn’t the only ‘hood that can satisfy your soul-food cravings. At Johnsie Mitchell’s Prospect Heights joint, the prices are cheap and the portions more than generous. The move here is to order the dark meat -- the crispy, peppery crust puts up a tough front, but one bite into it will unleash the moist and tender meat inside. 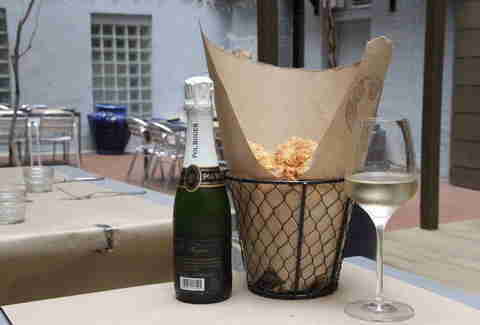 Alisha Prakash is a contributing writer at Thrillist. She's counting down the days until National Fried Chicken Day. Follow her on Twitter and Instagram.